Patuxai is one of the most famous monuments in Vientiane, the capital of Laos. 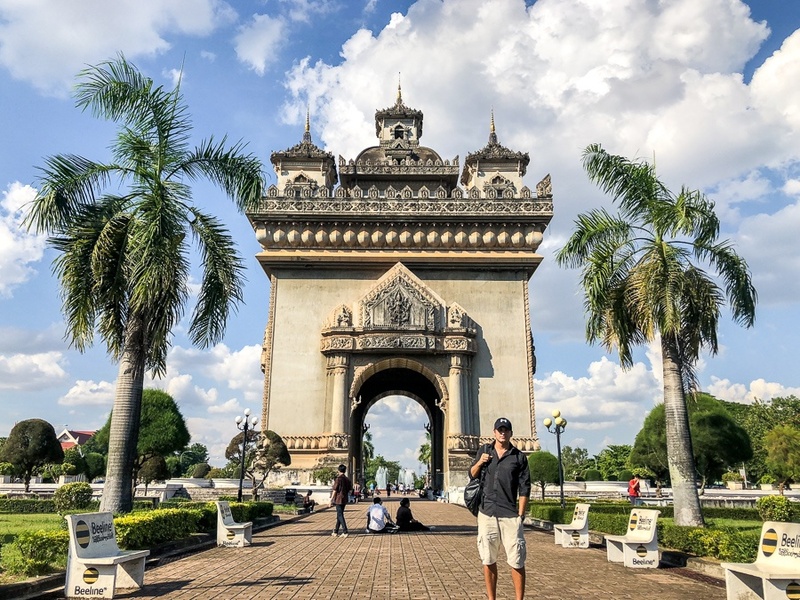 The name means ‘victory gate’ and it’s dedicated to the Laotian struggle for independence from the French in the 1940s. If you’ve been to Paris before, you’ll notice that the design of Patuxai Monument is really similar to the famous Arc de Triomphe in Paris. This building in Laos was modeled after the Arc, but it has an obvious local flair to it too, like the Buddhist figures and stupa shaped points on top. Personally I think this one looks a lot cooler. If you go to the top of the monument for 3,000 kip (35 cents), you can get a good 360 degree view of the city of Vientiane. Patuxai is located in the Vientiane city center. It’s a pretty small city, so you can easily walk to this monument from a hotel, which is what I did. You could also take a bicycle or taxi; there are some tuk-tuk taxis sitting around near the monument if you need a ride back to your hotel afterwards.